Ethylene (C2) Feedstock – in December prices fell by Eur 42/mt. This significant price fall has been driven by reductions in crude oil and naphtha. Both demand and supply are at low levels. Propylene (C3) – in December prices fell by Eur 96/mt. Reductions in oil and naphtha have driven the lower pricing levels. Supply and demand are at low levels. 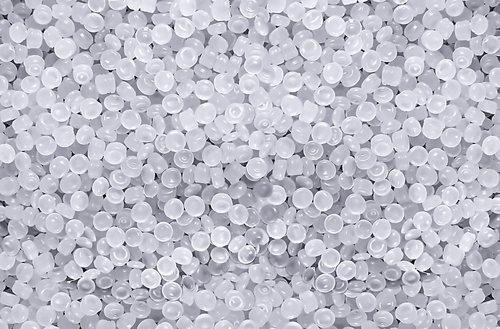 LDPE, LLDPE, HDPE more significant price reductions have filtered through in December. Supply and demand are at low levels. 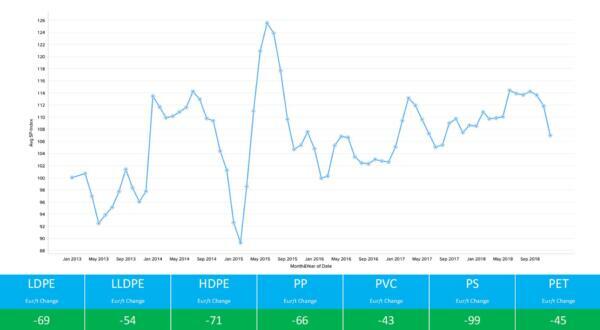 PP pricing decreased by Eur 66/mt in December although it is noted that producers have held on to some of the decrease to improve margin positions. Both demand and supply are at low levels. PVC pricing levels decreased by Eur 43/mt in December. Supply is at normal levels but demand is low due to the shorter month (Christmas period). The decrease is largely attributed to the fall in Ethylene feedstock prices and the lower demand v supply levels. Styrenic prices experienced a further significant Eur 99/mt decrease in the month on the back of further significant falls in styrene monomer pricing levels. Supply is at normal levels but demand is weaker due to the shorter month (Christmas period). Benzene feedstock pricing decreased significantly by Eur 61/mt in the month. This decrease is driven by further falls in oil and naphtha pricing. The market remains over supplied with high production levels and high levels of imports from Asia producers. Demand is at normal levels. PC prices reduced by Eur 152/mt in December. Supply is at high levels due to full inventories caused by lower demand. The shorter month due to the Christmas period also helped price cuts. PA6 pricing was largely stable in the month of December. Supply is at lower levels as producers have throttled back on production but this was matched with a shorter production month from a demand perspective due to the Christmas period. PA66 pricing was largely stable in the month. The supply situation remains difficult and at low levels however this was balanced with lower levels of demand attributed to the Christmas period. Forward it is expected that further price increases are on the horizon. 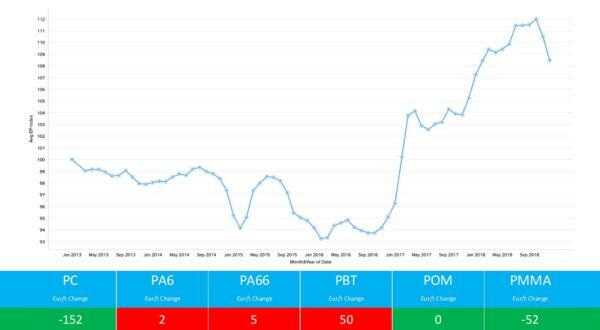 PBT pricing averages increased by Eur 50/mt in December. Supply is at normal levels but demand is low (due to lower demand from the automotive market). POM pricing was stable during the month. Supply is at lower levels but this was well balanced with the shorter production month due to the Christmas period. PMMA pricing reduced by Eur 52/mt in December. Supply is at normal levels but demand was low due to the shorter production month. Price decreases are expected in the coming period due to continued low demand from the automotive sector. Plastrack is a web based tool which can be accessed by desktop, tablet or mobile and provides pricing data on the most common feedstocks and polymers. Prices are updated on a monthly basis based on information obtained by Plastrack researchers directly from plastics producers, traders, distributors and converters. Visit Plastrack’s website for more information.